Scroll down to see the new releases from William Phillips! William Phillips - Painter of American Nostalgia. A small town is like a pocket mirror reflecting events taking place in the world at large. This is where history really happens, in the families of our neighbors, in our own living rooms, over the course of decades. William Phillips chooses this intimate stage to chronicle America’s past and present in his nostalgic series of landscapes set in the idyllic small town of Phillips Bay. This charming village is everyone’s dream hometown, where we all want to raise our children and eventually retire. A town of church socials, band concerts and Fourth of July parades, where everyone is free to find their dreams and live them. William Phillips painted his first nostalgic piece, a painting of an old car with a rumble seat crossing a wooden bridge, in 1975. The Phillips Bay series of landscape paintings was introduced in 1998, and since that time he’s explored the neighborhoods of Dogwood County in loving detail, from the 1930’s through the difficult days of WWII, to the present day. Each painting holds clues that reveal the era it depicts—look for vintage autos and boats, or the evolving infrastructure and landscaping of the village itself. Phillips’ fans know to look for an aircraft in his paintings; a friendly little nod to his other love, aviation. He was born in Los Angeles, California, in 1945. His talent for drawing and his interest in aircraft both emerged at a very early age. As a boy of twelve he would go to Van Nuys airport and watch the California Air National Guard F-86’s take off and land; he rushed home to try and sketch their sleek lines in motion. Phillips’ love of flight led him into the Air Force. He was stationed at a number of bases, including Tan Son Nhut, where he spent many afternoons sketching the various aircraft on the base and the beautiful clouds that gathered daily during the monsoon season. After discharge Phillips attended Southern Oregon University, majoring in law while living and working at a firestation as a student firefighter. He worked for the City of Ashland, Oregon, as a city firefighter for twelve years, then spent another four years as a wildland firefighter, continuing to hone his painting skills all the while. The turning point came when four of his WWII aircraft paintings displayed in a restaurant sold. This gave him the impetus he’d been waiting for to put his new law degree aside and follow his heart to a full-time life as an artist. Over the course of his amazingly successful thirty-year career in aviation art, Phillips’ thrilling portraits of military and civilian aircraft have placed him firmly at the top of this competitive field and garnered national recognition, including a one-man show at the Smithsonian Air and Space Museum. This retrospective show of over forty paintings subsequently toured the country to great acclaim. William Phillips lives in Ashland, Oregon, with his wife, Kristy. 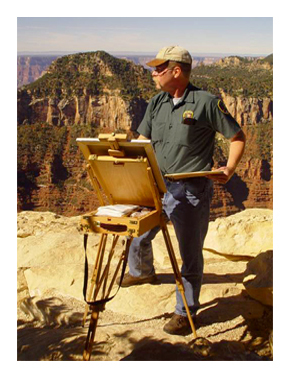 Photo shows Phillips during his term as Artist in Residence at the North Rim of the Grand Canyon.